What's the problem with literacy at college? How might everyday literacy be harnessed for educational ends? 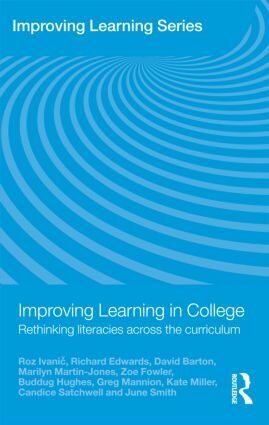 Based on the first major study of literacy practices in colleges in the UK, this book explores the reading and writing associated with learning subjects across the college curriculum. It investigates literacy practices in which students engage outside of college, and teaching and learning strategies through which these can help support the curriculum. With insightful analyses of innovative practices, it considers ways of changing teaching practices to enable students to draw upon their full potential. Recent research work has challenged the myth of individual student deficit, arguing cogently that people have ‘funds of knowledge’ from diverse and vibrant cultural roots, and that these have been misguidedly disqualified by the education system. It has claimed that different ‘ways with words’ can provide valuable resources for learning. However, the empirical exploration of this claim has lagged far behind the theoretical debate. Improving Learning in College resolves this by showing the integrity and richness of the literacy practices of a significant population, not previously the focus of such research: those who take vocational and academic college courses in colleges. It addresses an issue which has not until now been developed within this research tradition: that of how these practices can not only be valued and validated, but mobilised and harnessed to enhance learning in educational settings. This book will interest all teachers, teacher-educators and researchers concerned with post-compulsory education and vocational education in compulsory schooling. Part III What are the implications?